In 2006, after several years of looking at stacks of unfinished projects, I decided to do something about it. 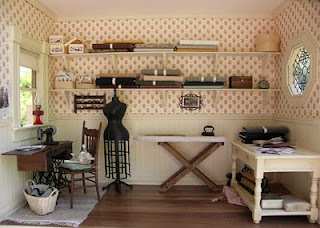 My first completed project was a seamstress shop with an upstairs workroom. 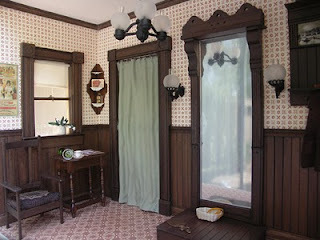 I added a porch and foundation to the Real Good Toys wall hanging house kit. The bricks were made from basswood brick strips I purchased from Earth and Tree. 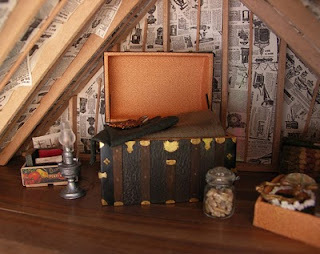 I used several shades of acrylic paints to achieve the brick look that I wanted. The round ornaments on the trim were made from Sculpey that was pressed with part of a snap from clothing to give them a round, multi-leveled appearance. Most of the items were either kit bashed or made from scratch. I just LOVE every little bit about this project. It is wonderfull!I love it!The project of the building is your or is it a kit? 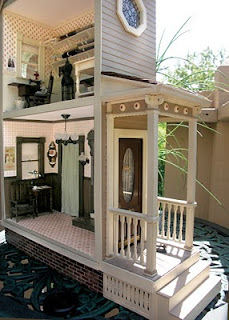 Hi Sonya, it is a Real Good Toys kit that I customized by adding a porch and foundation. Thanks for stopping by! I love you seamstress shop, the little old-fashioned sewing machine, just like one my Mum used to use. It is delightful.